Keeping Busy: Week Two - Come and Gone! Week Two - Come and Gone! 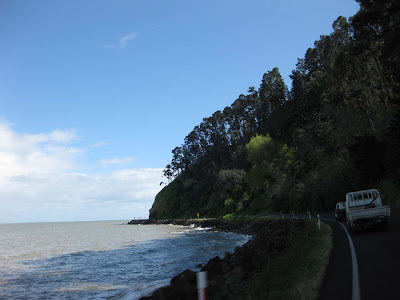 On Tuesday morning, Shannon and I packed up her little car and we started our road trip down to Bay of Plenty to stay in Tauranga. We visited some shops in Paeroa, a little town that's famous for making a soft drink called L & P, which is lemon and paeroa (whatever that fruit is, I'm not sure) and happens to be really delicious. On the way down, we stopped in some little towns and checked out some of the antique stores. 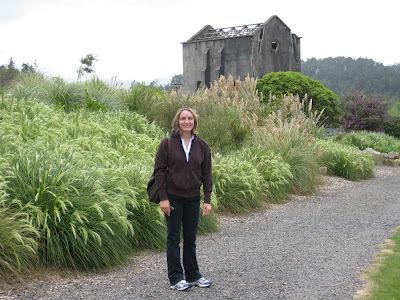 Shannon is standing in front of an old gold mine that is a working mine in Waihi. 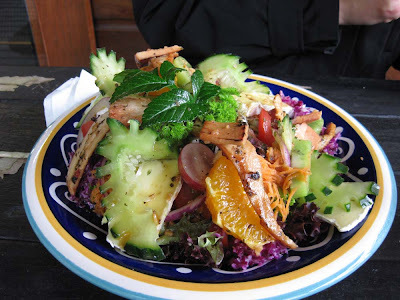 We arrived in Tauranga in the afternoon and went directly to the Strand, a row of restaurants and shops and had a small chicken burger to hold us over. After that we headed to John and Flick's house. 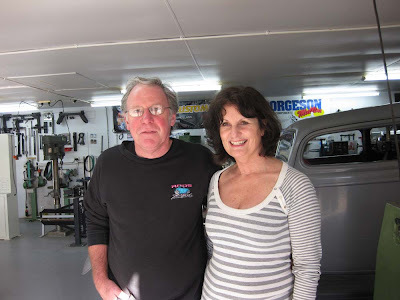 Flick and John live out in the country at the end of a long road, and there's a really long driveway that circles around and up to their beautiful home and hot rod shop. Here are our gracious hosts, John and Flick Reid. They happen to be good friends of Pete and Carol. We met them at Bonneville, but, we actually met them years ago in 1988. They have been to the DF shop and know Roy (dad). This is the shop, and the house. 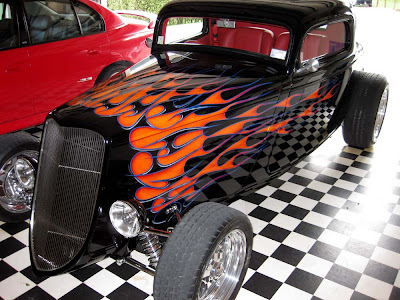 Here's the hotrod that lives in the garage. Great Flames! The garage is also the party room with a cool bar and lots of cool posters, pictures, memorabilia they have collected over the years. 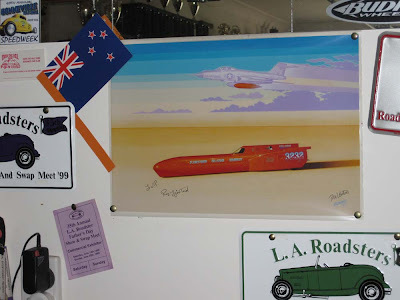 This is a print of dad's streamliner, signed by Roy himself. Wow, it's hanging all the way around the world. 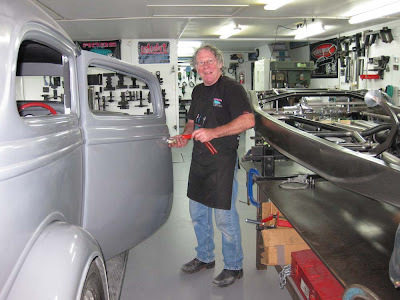 John has the reputation as the premier hot rod builder in New Zealand. His shop so clean, there are at least 4 projects going on at once. 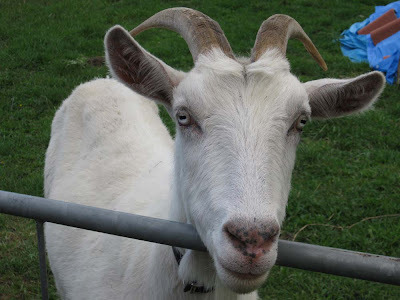 This is Billy - the pet goat. Here are Kiwi plants, vines, like growing grapes. 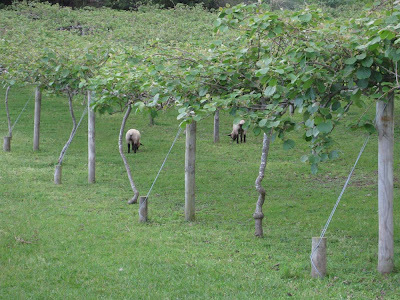 The sheep are grazing below the vines. Very cool. I always thought kiwi fruit grew on trees. Duh! 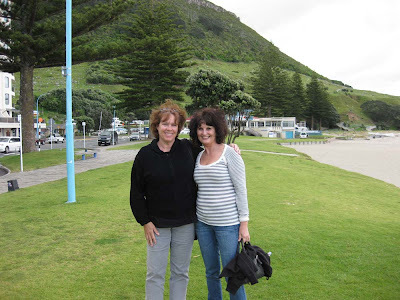 Flick took us on a tour of Tauranga and Mt. Manganue (sp?) (FYI - Carol walked around it when she was here.) We decided not to because it was pretty cold and windy. next time. Flick and John thank you so much for your hospitality, delicious dinners, and great friendship. Earlier in the day on Wednesday, Shannon and I decided to hike in the Hankie-krankie Gorge (that's not the real name, but it sounds like that). 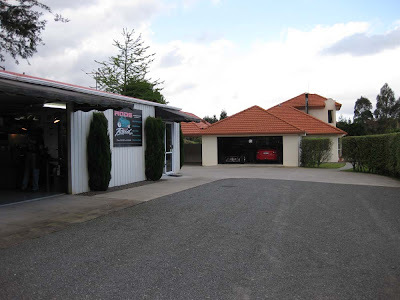 On our way to the Gorge, we stopped in Katikati to have a cup of coffee and look at the shops. 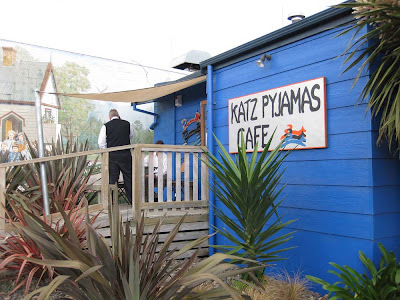 We went into the Katz Pyjamas Cafe and had a cup of Flat White, which is coffee with frothy milk on it. 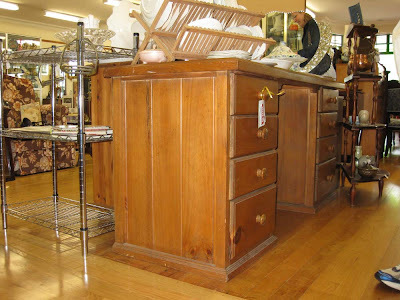 Then we looked in a antique store and found the perfect desk for her room. She bought it and had Grant take her down today (Sunday) to pick it up. A short 2 hour ride. But well worth it. It fits in her room and now she can set up her painting projects and get some art done. We finally headed down to the gorge, an hour and a half later. It's an old mining and processing plant at the side of a river, with hanging bridges and old ruins. They mined for gold and other metals here. Shannon walking up a path at the gorge. After walking around for an hour or so, we went across the street to have lunch at the Talisman Cafe. 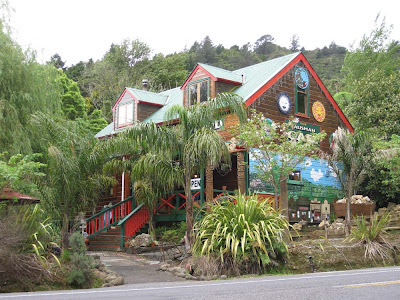 This is the neatest looking old house, painted in bright colors and artwork on the side. We sat out on the patio. 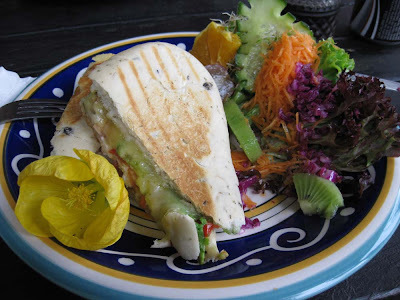 I had a paninni - it was so good - and pretty. Shannon ate a salad - can it get any better looking? 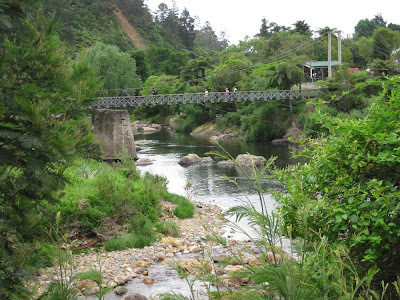 On Thursday we said good-bye to Flick and John and headed up to the Coromandel peninsula. We only made it half way up, but saw enough to get the idea. We stopped along the way and looked out at the Bay of Firth. We drove through the town of Thames, very nice. 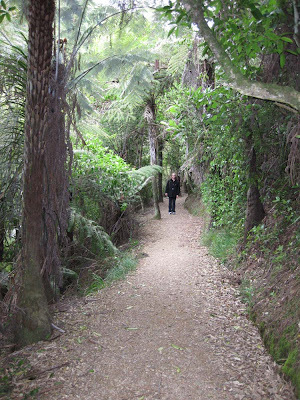 When we got back to Auckland, Shannon took me to see the Botanic Gardens. 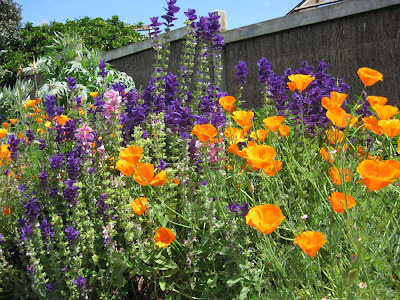 We walked around an amazing garden with beautiful flowers, plants, trees, all in bloom because it is spring here. It's Sunday evening. 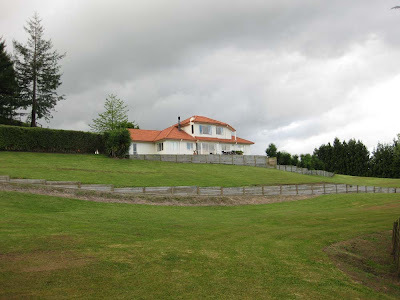 Tomorrow we are flying down to the south island to Wanaka to visit Garth and Andrea Hogan and will return on Friday. So - I won't be blogging until next weekend, but you'll have to check out Shannon's blog next weekend because I'll be flying home on Sunday and probably won't write again until I'm home. Last night was the big party here at Pete and Rebecca's house. It was a joint party for Pete, Shannon and Murray, all birthdays are in October. What a fun time we all had, Thank you Rebecca and Pete. I hope everyone at home had a fun Halloween.